Notice: All Special Order products from HeatFab must total $200 in order for us to have the factory ship the items out. HeatFab, bought out by Selkirk, has imposed these limitations on us, so we must place them on you. 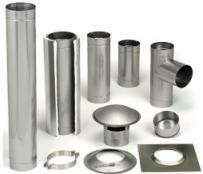 12" Length : 4" 304 Alloy Saf-T Liner 24 ga.
18" Slip Connector: " 304 Alloy Saf-T Liner 24 ga.
SS Tee - fixed Take Off; Heat-Fab 304-SS 4"
SS Tee for 4 1/4 - 3" fixed Take Off; Heat-Fab 304-SS 4"
Tee; w/Easy-On Strap; Heat-Fab 304-SS 4"
Flex Tee; w/Easy-On Strap; Heat-Fab 304-SS 4"
Flex Tee; w/Easy-On Strap& Flex Clamp; Heat-Fab 304-SS 4"
Tee for 4 1/4 - Flex-Fixed Take Off; Heat-Fab 304-SS 4"